A cardboard or wooden box, a large plastic storage bin, an acrylic or glass fish tank, or even a kiddie pool could be turned into a suitable home for chicks. 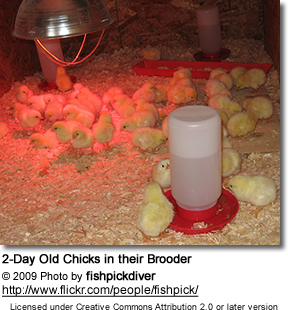 Whatever you use as a brooder needs to be thoroughly cleaned and disinfected before placing the chicks in. After cleaning the brooder, DO make sure to rinse off any disinfectant, as any residue may poison the chicks. If you are using a cardboard box that can't be cleaned, be prepared to provide a new box with fresh litter every day. It is important that the box is 12" high - or preferably even higher - as you will find that the chicks can otherwise get out of the box quite easily. Indeed, if the brooder is only 12" high, you will often find chicks perching on top of it! One way to prevent that from happening for the most part is to put some sort of cover on top of the box. 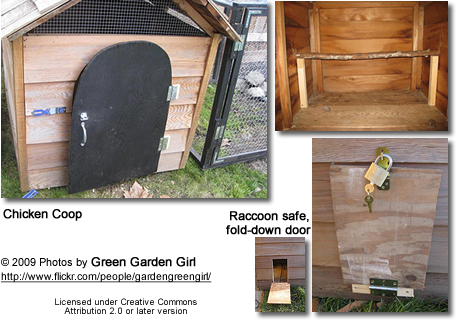 Partially cover the box with say newspaper, cardboard or towels to keep the chicks in, keep out drafts, and still allow some fresh air in. 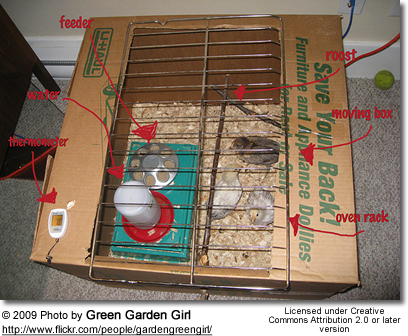 If other pets are around, like dogs and cats, a more substantial screen or wire mesh is needed to cover the box and protect the chicks from predators. It is important to protect the chicks from drafts; however, they do still need adequate ventilation. Leaving some opening at the top or punching some holes into a cardboard or wooden box, for example, would serve that purpose. The needed box size depends on the size and number of chicks it will house. 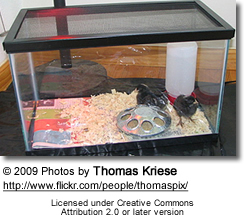 If you initially choose the minimum size (please refer to below), the box size will have to be increased as the chicks grow. The chicks should have plenty of room to move around in; they should also have enough room to get away from the heat of the bulb, if they need to. It is preferable to provide about 2 sq.ft. per chick right from the start. 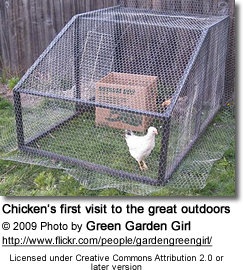 You will find that the enclosure will get far less messy when there is sufficient space for the chicks. What is important is that the enclosure needs to be kept clean and dry. Setting the enclosure up RIGHT from the start, will help facilitate the process. Please note that rare and exotic birds, particularly parrots and other chicks that hatch naked and are fully dependent and helpless require very precise temperature control. In cases such as that, commercial brooders are always preferable as they allow for the accuracy and dependability needed to successfully raise these chicks. Should a commercial brooder not be an option, the following resource might be helpful: Set up your parrot chicks after hatching using material you might already have. Once the brooder has been cleaned and is completely dry, the floor of the brooder needs to be lined with an absorbent material. Baby chicks are big poopers and they will make a mess with food and water as well .... So be prepared to change the litter frequently throughout the day. The first 3 below-listed options are best for the youngest chick. Having a thin layer of feed on the brooder floor, will allow the chick to find its food quickly, and not adding other litter at this point prevents them from eating the litter instead of the feed. After about a week or so you can use one of the other litter options. Paper towel: If you only have a few chicks, paper towels work fine. Change often. Newspaper / Newsprint: The problem with using newspaper is that it is not nearly as absorbent as the other options and the slippery surface can lead to a permanent deformity called "splayed leg." Affected chicks are often picked to death by the other chicks. HOWEVER, shredded newspaper works fine. Wood Shavings: Please note that wood shavings, such as cedar and redwood, are toxic. The aromatic oils of cedar shavings will irritate your chicks' lungs and make them more susceptible to respiratory problems later in life. Wood shavings may also cause crop impaction. HOWEVER, many use pine shavings quite successfully -- spread on the floor of the brooder about 1 to 2 inches deep. About 2 inches of litter material give the chicks better footing and help keep the box clean. Replace the litter when necessary to keep the box clean and dry. Some sort of heat source is needed to keep the chicks warm. In some instances, a heating pad underneath a fish tank or storage bin may work fine. 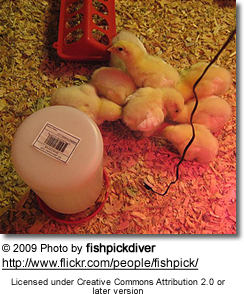 Most, however, opt for a 250-watt infrared heat lamp / bulb to keep the chicks warm. Please ignore anyone who tells you that a 60-watt bulb will suffice. Too many chicks get chilled and die because of this bad advice. The chicks need a lamp that produces heat -- only a 250-watt bulb will do for the most part. You can screw the bulb into a spotlight reflector with a clamp to hold it in place. Bulbs and such reflectors with clamps may be available in hardware stores or brooders are available online. Red bulbs are preferable for a couple of reasons. Bright white light will make it harder for them to sleep. The red light is darker and provides a calmer environment. Also, it has been noted that chicks tend to peck each other when they are exposed to white light - a problem that is far less frequently seen when red bulbs are used. Also -- as a general rule, young chicks tend to do better in dark brooders. Suspend the lamp off the ground right in the middle of the brooder. The height of the light will depend on what it takes to achieve your target temperature. It's important to position the lamp to maintain the proper temperature and yet high enough to not ignite the litter or burning the chicks. Important: The bulb / heat source should be far enough away from the edge of the box that it won't start a fire. *1 If you have several chicks, the temperature can usually be a little lower as the chicks keep each other warm. Single chicks have fewer options to self-regulate. 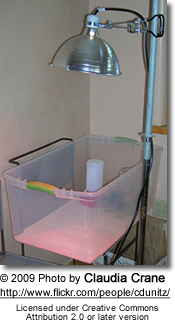 *2 - In many cases the lamp can be removed once the temperature was regulated down to 70 degrees Fahrenheit -- however, if outside temperatures are much cooler, then the lamp needs to stay on and temperatures have to be slowly reduced to be close to that of the temperature they are going to be maintained in. However, don't consider the above temperature guidelines as your only guideline. Pay close attention to how the chicks behave. Cold chicks may be huddled together underneath a heat source and may cheep loudly and insistently. In this case, you need to increase the heat in the brooder. Either lower the lamp or move the heat source closer to the chicks (not close enough to burn them though) or add another lamp. This could also mean that the box is too big and the heat gets dispersed too much. If the chicks stand apart from each other and away from the heat source, they may be too hot and could possibly suffocate. You may also observe them panting (with their beaks open). In this case, either raise the heat lamp, reduce the bulb wattage or get a bigger box. Ideally your chicks should be making contented "peep" noises and pursue their normal activities of walking around, pecking at the food, drinking water - or sleeping when they are tired. Particularly older chicks love to roost on poles or branches. 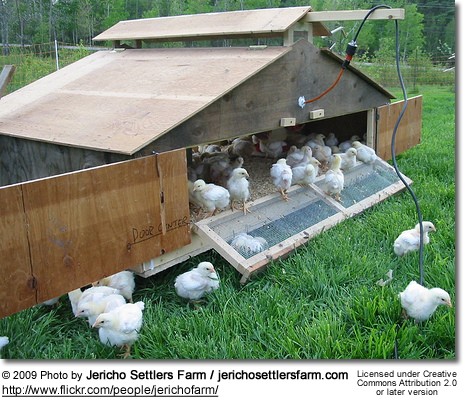 It isn't NECESSARY to provide these perches, but the chicks will generally be happier if they have those places, plus it will keep the chicks off any soiled litter. Wooden dowels or cleaned branches, about 0.5 inch in diameter, work well for this purpose. Place them several inches off the ground and away from their water and food dishes. The upside of using these perches is that the chicks may not roost on their food and water dishes, which cuts down on them getting soiled. NEXT STEP: Once you sorted out the housing of the chicks, there is still a lot to know about their care. 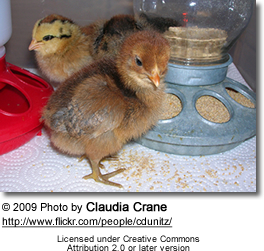 This webpage has all the information you need to successfuly raise poultry chicks from day one. If you have parrot chicks a good-quality commercial brooder is the better choice as they hatch naked and helpless and they need very specific and reliable temperature settings. HOWEVER, if no such commercial incubator is available, one could customize a brooder that is more specific for their own needs. Since they don't move around much, they don't require as much space as say poultry chicks. For a few chicks, for example, ~ 12" x 12" will do fine. A plastic tub works best as it is easy to disinfect / clean. Cardboard boxes get wet easily from the chicks droppings -- and that isn't exactly a healthy environment. Getting the temperature right is more challenging and requires a rather constant room temperature. They do have a way of self-regulating their temperature. They will huddle together, for example, to keep warm. This is one reason, why it is easier to raise several chicks together rather than just one. When they are with their parents, they will climb underneath their parents to keep warm. I successfully duplicated that by draping a towel loosely over the brooder, allowing it to fall on the floor in the middle, but it's important to make sure that the sides of the towels are firmly attached to the sides of the box so that the chick cannot get entangled in it. A chick must be able to move under the towel freely, but if it gets warm, it needs to be able to get out easily as well. 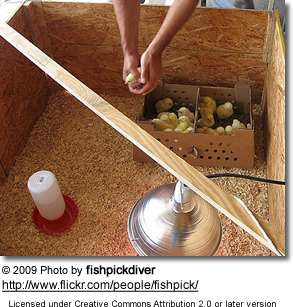 In smaller boxes, place the lamp above the brooder fixed to one end, in larger boxes in the middle. Chicks do self-regulate to a CERTAIN extent. There shouldn't be too much of a distance between the cooler and the warmer areas. However, don't consider the above temperature guidelines as your only guideline. Pay close attention to how the chicks behave. Visual clues that your chicks may be too warm or too cold. Please refer to this webpage for detailed care requirements and problems you may experience.